This Shorthorn Stud is located near Deniliquin in the southern Riverina area of NSW, Australia. 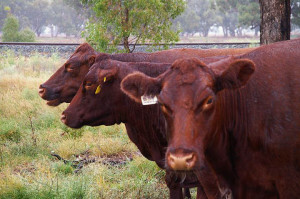 Steve and Amanda Barlow established Toogimbie Shorthorns in 1994 with the purchase of ten purebred Beef Shorthorn commercial heifers from the Schiller family, ‘Tarwong’, Hay NSW and the polled Stud Shorthorn bull, Caskieben Quock, from G. and J. Williamson, Caskieben, Carisbrook, Victoria, Australia. We ran the cattle on our property, ‘Toogimbie’, on the northern outskirts of Deniliquin in the southern NSW area of Australia until we purchased the property ‘Heatherleigh’ situated south of Deniliquin in 2004. In 2008, we moved from Deniliquin to ‘Gulpha’ at Mathoura and the cattle are now run on an aggregation of adjoining properties: ‘Heatherleigh’, ‘Woodlawn’,‘The Pines’, ‘Nixons’ and ‘Coragulac’. ‘Heatherleigh’ and ‘Gulpha’ adjoin the Gulpa Creek which provides a valuable water source and the background for some beautiful forest country. ‘The Pines’ has the benefit of bore water which can be used for irrigation while ‘Coragulac’ and ‘Nixons’ are dryland properties with no irrigation. From an original group of ten cows and one bull, we have developed a high quality self replacing herd of over 300 top quality shorthorn cows. We have sourced top Australian genetics to do this, purchasing high quality Shorthorn bulls and cows from some of Australia’s top studs. Our Australian shorthorn cattle are bred to thrive in the harsh Australian environment. We believe they are an excellent product and we are committed to gaining better prices for better beef. An online photo gallery of our property and our cattle. Photos and in depth description of each of our elite cows. Includes a link to pedigree information. Photos and in depth description of each of our bulls. Includes a link to pedigree information.